Fumi Grace Maxi Doll | Kimmidolls Figurines | One Price Low Flat Shipping! From Enesco Giftrware's Kimmidolls Sentiments Doll Collection, Fumi Grace Maxi Doll. Made of stone resin. Measures 4.25" tall. Packaged in windowed gift box and comes with a collector's card describing this doll character's individual inspiration and spirit. I am Grace. My spirit is sincere and dignified. In every cirsumstance the nobility of my spirit shines through your diligent courtesy and modest dignity. May your sincerity and quiet humility be an inspiration for all to see what it means to live graciously. 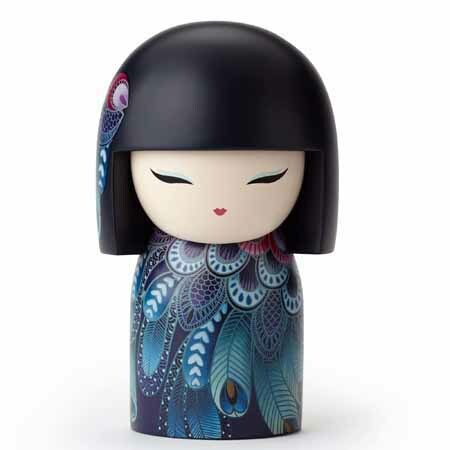 This Kimmidoll figurine has black hair and is wearing a blue dress with green, purple, and blue feathers that look as if from a peacock's tail.